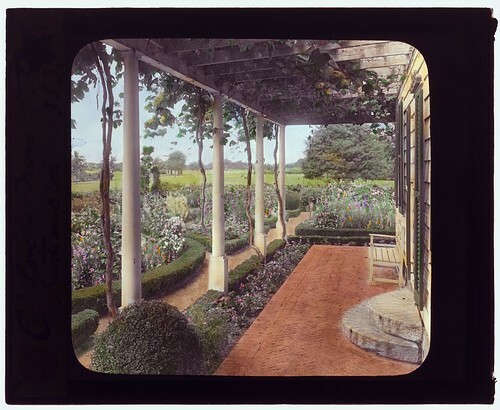 Many old gardens — even impressive ones like this — understood the need for a porch…and a great view from that porch. Here the homey back porch looks out on a somewhat formal garden design. The boxwood hedges are neatly clipped, but the flowers inside seem exuberant and ready to break out of their confines given half a chance. This garden also sported something many of us dream of today…a view to the surrounding countryside. This upstate New York location reminds me of the childhood in Ohio. The land is flat, but the view is broken by fence rows, wood lots and streams, which help to provide visual interest. Here in Los Angeles, nearly every houses hemmed in by fences and walls so gaining any sort of “view” from your garden is difficult, if not impossible. Even large gardens such as this look inward, not outward. Hillside homes can gain some sort of view, but the real estate in these areas is out of reach financially for most. Site History. House architecture: 19th century farmhouse with additions. Associated Name: Eva Johnston (Mrs. Henry E.) Coe. On slide (handwritten): “C,” “Coe, Mrs. H.E., Southampton,” and no. “353”(?) Also, gold star sticker and blue star sticker. Photographed when Frances Benjamin Johnston and Mattie Edwards Hewitt worked together. Published in Gardens for a Beautiful America / Sam Watters. New York: Acanthus Press, 2012. Frontispiece plate for Gardens of the East. Categorized under: Flowers, Garden History, History, Landscape, Photos.